Easter Lilies (Lilium longiflorum) are beautiful, large and trumpeted-shaped flowers that offer a fantastic fragrance. They’re a stunning spring flower to give and are typically well received with those who love modern and traditional-looking blooms. If you’re buying and sending Easter Lilies in the United States, more than likely your flowers will have been cultivated by a handful of growers located along the Oregon and California borders. This area is known in the flower industry, and sometimes in other circles, as the “Easter Lily Capital of the World.” In fact, more than 95% of the 11-1/2 million Easter Lilies cultivated and sold in the United States originate in Oregon and California. Many people think Easter Lilies are more difficult to grow than other lilies, but they’re really not. The confusion likely comes from the way commercial Easter Lilies are forced to blossom before the holiday. This can put strain on the flower and make them a bit sensitive, and therefore require a moderate amount of extra care. It’s tempting to buy an Easter Lily that is already in full bloom, but consider that flowers in various earlier stages of development might be more hearty and last longer. From tight buds to marginally opened flowers, you can give an Easter Lily that is not in full blossom and still offer a beautiful gift. 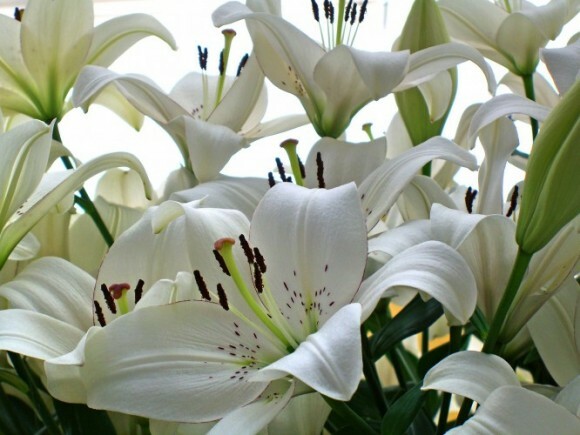 When choosing Easter Lilies, make sure you pick flowers with dense foliage that extends the full length of the stem (all the way to the soil line). The Easter Lily should have a uniform healthy and rich green color. Check to see that there aren’t any signs of insect eggs, webs or actual bodies. Disease shows up on Easter Lilies in the form of crinkling or wilting leaves, or leaves with dark spots. Easter Lilies are some of the most enjoyable flowers to give and receive. Consider them when deciding on the right flowers for a spring or Easter surprise.